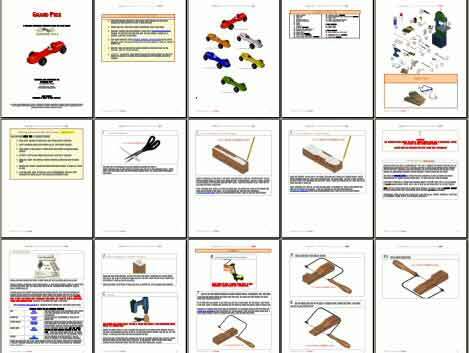 Grand Prix - Pinewood Derby 3D Design Plan - INSTANT DOWNLOAD! "With this design and your wheels, axles, lubricants, decals, and speed secrets, my grandson took first place in his cub scout local race. He was so excited to win the trophy and was glad he had spent the time helping to build the race car." See The Grand Prix pinewood derby car take shape step-by-step with 3D illustrations, including weight placement, hints, building tips and cut-out templates for cutting guides...the clearest car plan on the market! See your car in 6 different colors, plus a 360 degree animation so you can view it from all angles! Speed to the finish line with the Grand Prix! Was great but a bit much on the ads for printing. Worked well with my weights. Once my son figured out directions, he was able to build a good reproduction of the design. Car plans were simple and straightforward. Uncomplicated, allowed my kid and I to get it done! My son and I were newbies to Pinewood, but found this car easy to make. We roughed-out the basic shape with a coping-saw, and refined it with a hand held motor and sandpaper. Really happy with how it turned out. The instructions are clear and thorough, but don't need to be 32-pages long. I printed the template page actual size, and the rest two-pages-on-one, and even my middle aged eyes could cope. With this design and your wheels, axles, lubricants, decals, and speed secrets, my grandson took first place in his cub scout local race. He was so excited to win the trophy and was glad he had spent the time helping to build the race car. Many thanks Joe!